The flawless smiles that gleam from the covers of celebrity magazines may seem out of reach or something only accessible for the rich and famous, but at Heart of Texas Smiles, our skilled dentist and team offer a range of cosmetic dentistry services to meet any need and fit any budget. Whether you want to make one small adjustment or completely transform your smile, our Waco dental office is here to provide the treatments you need. To get started, call our caring dental team to schedule a smile makeover consultation. A knowledgeable cosmetic dentists Dr. Nick Cobb or Dr. Teresa Lassetter will sit down with you one on one, examine your smile, discuss your goals, answer questions, and partner with you to create a smile makeover plan that will deliver the beautiful smile you deserve. Why Choose Heart of Texas Smiles for Smile Makeovers? A smile makeover is a cosmetic dentistry plan that may combine any number of cosmetic and restorative dentistry services as well as orthodontic treatment to create a flawless smile. In most cases, this term refers to a more complex process that is completed over the course of several weeks, months, or even years. What Treatments are Included in Smile Makeovers? During your smile makeover consultation, we’ll discuss all of your cosmetic dentistry options and develop a personalized treatment plan. Before your visit, we recommend you take a few moments to consider what aspects of your smile you’re unhappy with. 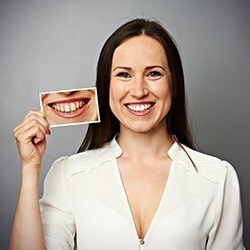 Then, think about what your ideal smile would look like. If you have a friend, family member, or even a celebrity smile in mind, bring along photos. This is a great way to make sure we’re on the same page when discussing the changes you want to make. During your appointment, a team member will capture images and x-rays of your smile. These will be used throughout the treatment planning to process. In many situations, we can show you photos of our past patients to give you a better idea what to expect from specific treatments, so please let us know if you’re interested.